Carceral Geography at the AAG Chicago 2015 – Final Line-Ups! Those attending the AAG in Chicago are very welcome at any or all of the seven sessions on carceral geography that will span the first and second days of the conference. 8:00 AM *Christophe Mincke – Prison: Legitimacy Through Mobility? 1441 Carceral Geographies III: Activity, Agency and Organisation. 1:40 PM *Geraldine Brown, Elizabeth Bos, Geraldine Brady, Moya Kneafsey, Martin Glynn – A holistic evaluation of delivering a community based food growing mentoring programme in a prison setting with substance misuse offenders. 1541 Carceral Geographies IV: Gendered and Embodied Confinement. 1641 Carceral Geographies V: (Re)defining Boundaries. 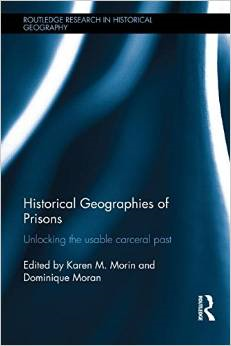 Karen Morin and I are delighted to announce that the new edited collection Historical Geographies of Prisons: Unlocking the Usable Carceral Past will shortly be published by Routledge. Conceived of following Karen’s Distinguished Historical Geography lecture at the 2013 Los Angeles meeting of the Association of American Geographers, the book draws in part on papers presented in the subsequent sessions on carceral historical geographies at the Tampa AAG in 2014. This is the first book to provide a comprehensive historical-geographical lens to the development and evolution of correctional institutions as a specific subset of carceral geographies. It analyzes and critiques global practices of incarceration, regimes of punishment, and their corresponding spaces of “corrections” from the eighteenth to twentieth centuries. It examines individuals’ experiences within various regulatory regimes and spaces of punishment, and offers an interpretation of spaces of incarceration as cultural-historical artifacts. The book also analyzes the spatial-distributional geographies of incarceration, particularly with respect to their historical impact on community political-economic development and local geographies. Contributions examine a range of prison sites and the practices that take place within them to help us understand how regimes of punishment are experienced, and are constructed in different kinds of ways across space and time for very different ends. The overall aim is to help understand the legacies of carceral geographies in the present. The resonances across space and time tell a profound story of social and spatial legacies and, as such, offer important insights into the prison crisis we see in many parts of the world today. The book will be officially launched at the 16th International Conference of Historical Geographers which will take place in London, at the Royal Geographical Society (with IBG) from Sunday 5th July to Friday 10th July 2015. A special panel has been convened for Thursday 9th July 2015, 14:15 – 16:00. Chapter contributors Rashad Shabazz, Kimberley Peters and Katherine Roscoe will join the book’s editors, and also Simon Naylor and Laura Cameron, the editors of the Routledge Research Series in Historical Geography, for which this is the first publication. Yvonne Jewkes speaking at Howard League Event. Basking in evening sunshine and thronged with tourists, the Tower of London looked anything but the forbidding fortress and feared prison that had earned it a fearsome reputation. 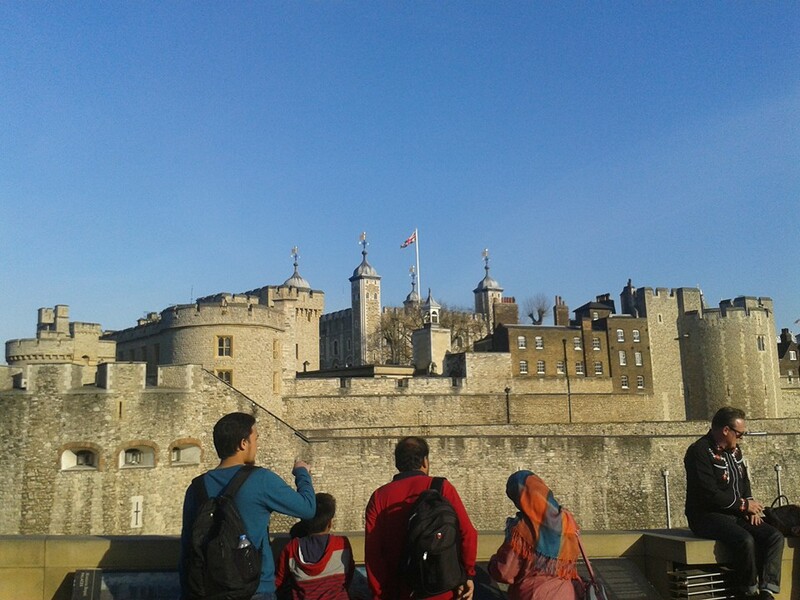 However, thanks to the Learning team at Historic Royal Palaces, one floor up from the jewel room, a fascinating discussion evolved from the holding of ransom-worthy prisoners in the Tower – human jewels, if you will, to the architectures of confinement that characterise contemporary incarceration. Sally Dixon-Smith, Curator for Historic Royal Palaces at the Tower of London, opened discussion with a talk about the history of the Tower as a prison. Although not its original purpose, the Tower was pressed into service to hold up to 10,000 prisoners over hundreds of years. High-profile prisoners famously included Anne Boleyn and Queen Elizabeth I. Sally explained that although the Tower had a fearsome reputation, prisoners could, depending on their status, expect to be accommodation in some style, with family accompanying them, and with right to hunt in the vicinity as long as a hostage was left in their place. Despite the grand surroundings, the Tower as a prison remained a place intended for the deprivation of liberty. Following on from Sally, I was invited to speak about my research in carceral geography – how and why prisons come to be as they are, how they are experienced by those who live and work in them, and what the implications of this are for how prison systems are managed, and what they are trying to achieve. My own work has focussed on carceral spaces in very different contexts – from Russia where prisoners inhabit communal living spaces in Soviet-era buildings constructed as part of the Stalinist Gulag; to hi-tech Scandinavian prisons which are considered the most ‘humane’ carceral environments, to both new and old prisons in the UK. In each case I’m interested in the message they were intended to convey about the purpose of prison in the eyes of the imprisoning state, and the ways in which that message is conveyed to prisoners, prison staff, and the community – both locally and nationally. Of course this changes over time, and so do prisons – and that’s why talking about these things at the Tower of London was so interesting – in a place which has changed so much through the centuries, but which is perhaps most famous for those who have been imprisoned within these walls, and indeed who sometimes met a grisly end close by. At the time that the Tower was a prison, imprisonment as we know it today didn’t really happen – in the 16th and 17th centuries prisons were mainly places to hold people until some other form of punishment could be meted out to them. Today, prisons are considered places where people go as punishment, not for further punishment – although this is always a contentious issue in terms of what it is that prisons are supposed to achieve. There is a balance to be struck between punishment and In the run-up to the UK general election, this was a timely debate to organise. Just as the role of imprisonment changes over time, of course it also varies from place to place – what was thought appropriate in the Soviet Union may not suit Scandinavia, or the UK. Prison systems as they exist in bricks and mortar – or stone – or steel and glass, reflect both the current philosophy of imprisonment of the ruling administration, AND the previous philosophies that were manifest in built form in the past – relics, if you will, of those ideas. So in the UK we have Victorian prisons still operational, alongside 21st century buildings, and of course we have other buildings, like the Tower, which were pressed into service as prisons having been initially intended for some other purpose, and when these buildings come to the end of their use as prisons, they could be used for something else again. All of these buildings, and the people affected by them, have a story to tell. That’s what I’m interested in. In a current research project, we’re looking at the processes of designing and building new prisons in the UK and Scandinavia, asking questions about how new prisons come to be as they are, why we build what we do, and how the purpose of imprisonment, conceived of within a particular political context, is translated into buildings. We’re also asking questions about how those buildings are experienced by those who live and work in them. What does a humane prison look like? Does the building itself matter for punishment or rehabilitation? What does a therapeutic building look like? Is colour important? What about views from windows? What do we know about the ways in which people are affected by the environment in which they live? Are new prisons necessarily better than old ones? What should modern prisons look like? Who is the audience for them? Of course prison design is about much more than just how the prison looks from the outside. There are also thorny questions about how prison architecture affects the ways in which prisons can be managed. How levels of staffing can be changed, how certain issues can be managed through the environment itself as well as through human interaction. Where prisoners spend many hours a day confined to cells, consideration is given to ways to reduce the opportunity for prisoners to harm themselves or others, removing ligature points or potential weapons. Underpinning this research are the very same questions that shaped the debate as a whole. What is it that a prison is fundamentally trying to achieve? How might it do that through its built form? What difference does design make to achieving those outcomes? And are the prisons that we have now, and that we will have in the future, going to be effective at delivering the outcomes we want? Of course these questions go far beyond prison design – they touch on issues of public opinion, rhetoric, media campaigns and electioneering. But they are critically important questions. The final speaker was Christopher Liddle, Chairman of HLM Architects who have been at the forefront of custodial and justice design for more than 14 years. Chris spoke passionately about the challenges of designing effective carceral environments – ones which maintain security and safety for prisoners and staff, and which also help facilitate the rehabilitation that contributes to reducing reoffending for prisoners after release. His message was that prison buildings matter very much for the outcomes that we want prisons and prisoners to have, and that through incorporating natural daylight, fresh air, views of outside spaces, especially higher-floor views over prison walls, the environment of prisons can be moulded to improve prisoner outcomes. Facilitated by freelance historian Lauren Johnson a large audience within the Tower posed some pertinent questions about the ability of the modern penal estate to cater for deaf prisoners; the architecture of open prisons and the ways in which this facilitates reintegration into the community; the challenges of managing long-term prisoners, and the political context for the commissioning and the designing of new prisons in the UK.